I have been in banking, primarily in lending, and have not had a formal course in accounting. Would I qualify for enrollment in the program? The requirement is that you have basic knowledge of accounting and economics, but your experience as a lender would meet the academic requirements. Will a university award academic hours to me upon completion of the program? Some universities may award academic credit to graduates. A major university awards 50% of the credits required for the MBA. 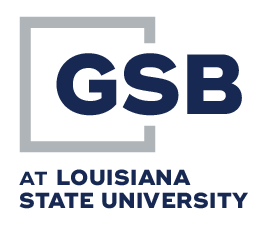 How does GSBLSU differ from other graduate schools of banking? We are an intensive, general banking school. GSB requires two week resident sessions for three years and completion of five bank study projects between the first and second year. Our students invest over 400 study hours in order to graduate. Prior to coming, some prospects look at the time involved and are overwhelmed. However, our students and graduates tell us not to reduce the time or subtract from the curriculum. Why does the session generally conflict with the Memorial Day Holiday? The session is held on the campus at a time traditional students are not present. This time falls between the Spring and Summer term, which usually coincides with Memorial Day. Are the courses taught at GSBLSU the same as I had in the state banking school I attended? Some of the courses at GSBLSU may have the same or similar titles as courses in the state schools, but they are taught at a higher level and with greater expectations at GSBLSU. Must I attend the banking school in my state before attending GSBLSU? It is not necessary to attend a state banking school prior to attending GSBLSU. Must I have a college degree to attend GSBLSU? A college degree is not a prerequisite to attending GSBLSU. May I complete the banking school if I leave the industry? Students at the school who find employment in other industries may complete the program. What costs are covered by the School’s tuition? The tuition covers all cost of instruction, housing, and meals at the session. Transportation to and from the session is the only cost not covered by the tuition. Should a personal or professional problem arise that prevents me from attending the May session, may I continue the school the following year? A student in good standing may miss two consecutive sessions and return to complete the School. Will my supervisor be informed of my grades at GSBLSU? Grade reports are sent only to the student enrolled. No one is informed of the students’ grades without his/her written instructions. How much time is required to complete the bank study projects? As a general estimate, approximately 20 — 30 hours is required to complete each project.